Did you miss the Francesca Woodman show at the Guggenheim? You can catch one of her spectacular pieces at the Met in the small contemporary photography exhibit, Spies in the House of Art. Francesca Woodman’s Blueprint for a Temple, 1980. Diazo collage. Gift of George and Betty Woodman to the Metropolitan Museum, 2001. The show features works by photographers, filmmakers, and video artists inspired by museums, collections, and exhibitions. 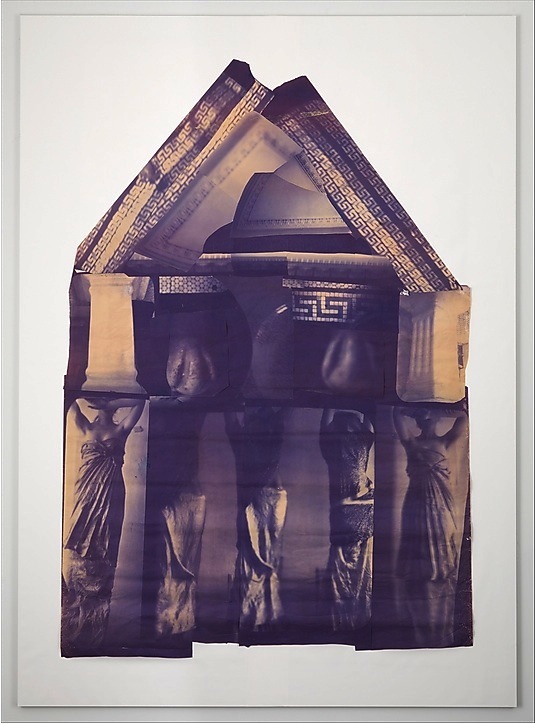 The standout (Cindy Sherman’s Italian history portrait notwithstanding) is the epic piece by Woodman: the large-scale Blueprint for a Temple made up of 29 photographs on blueprint paper. The piece uses live models as caryatids and everyday stuff to evoke classical architecture, and it’s an experience. The Met’s also given over a large, dark exhibition area to show Rosalind Nashashibi and Lucy Skaer’s film shot with strobes late at night when the Met’s ancient-art halls look particularly magical and spooky. Perhaps the most startling aspect of the installation is the medium. We’ve become accustomed to digital projection, but this experience is enhanced by the sight and sound of a 16mm film loop clicking through a 16mm projector. For some fun, be sure to sit down, put on the headsets, and listen in to Andrea Fraser’s 1989 fictional museum walk that’s also part of the show. And check out Peter Nagy’s 1985 work done when there was a citywide kerfuffle over the MoMA’s plans to renovate (remember that?). Nagy layers condominium floor plans over the old layout of the MoMA galleries. It’s hilarious.